Ice jams are causing elevated levels of stress as the Red River reached the minimum end of its projected crest on Thursday morning. Piles of ice could be seen accumulating near the Redwood Bridge and in front of the Winnipeg Rowing Club near the Norwood Bridge. An ice jam near the Elmwood Cemetery was also visible from Hespeler Avenue. The province has an Amphibex icebreaking machine on standby, but hasn’t dispatched it just yet. “The city expects that the ice jam will continue to move downstream and clear the city by the end of the day today,” officials said in a statement. Once the jam is cleared, it’s expected river levels will drop 1 to 1.5 feet. In the south end of the city, a solid layer of ice remains on the Red River near King’s Park. The city says when this ice begins to break up, it’s likely an ice jam will form in the St. Norbert area. Sandbag dikes in the area should be built up by Friday. Meanwhile, homeowners are frantically trying to protect their low-lying properties as river levels creep closer. 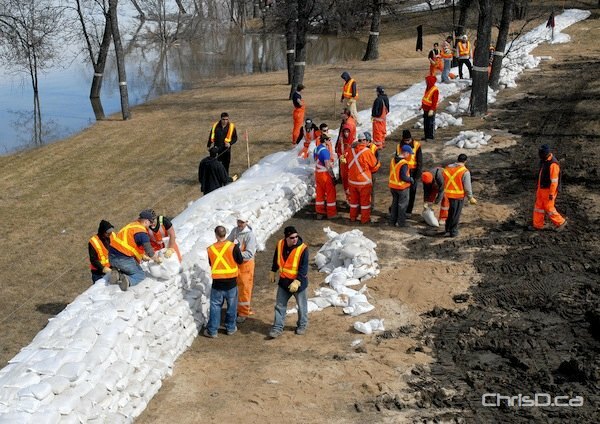 Nearly 700 volunteers have since registered with the City of Winnipeg to lend their help. To register, call 311 and pack a pair of rubber boots and gloves. City staff will direct volunteers to designated locations requiring assistance. Out of town residents that want to assist can call 1-877-311-4974 toll free. At present time, the Red River reached 20.24 feet at James Avenue, about two feet lower than the peak level in 2009. For emergency flood updates from the city, following them using social media. UPDATE #2 at 3:30 p.m. Provincial flood officials say the ice jams occurring on the Red River are lower than in previous years, but are still causing high levels. Forecasted precipitation for the weekend is expected to move into the province, but won’t have a major impact on river levels, as less than one millimetre will accumulate. Several locations along the Red River in the U.S. are either at bank-full level or are over the riverbank. 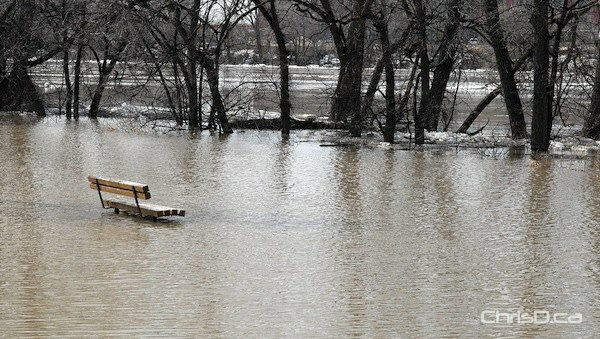 On the up side, the Red River flow in Manitoba is still within its banks. Officials also note the Red River Floodway gates may be open within 24 hours depending on if ice jams break up, diminishing the risk they could damage the structure.